Two(2) years minimum service for promotions to the next higher category, class or grade: TS GO 85 TS Subordinate Service Rules Minimum Service For promotion : G.O.Ms.No. 85 Dated: 18-05-2018. 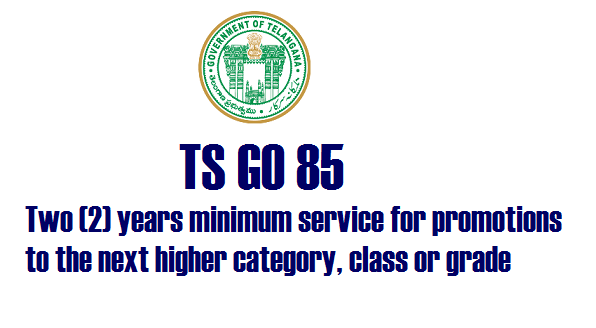 TS Subordinate Service Rules Minimum Service For promotion Minimum service of 2 years is stipulated in the category, class or grade from which promotion or appointment by transfer is proposed to the next higher category, class or grade Public Services – State and Subordinate services – Stipulation of minimum service for promotion or appointment by transfer to next higher category – Adhoc Rule - Issued. GOVERNMENT OF TELANGANA GENERAL ADMINISTRATION (SER.A) DEPARTMENT G.O.Ms.No. 85 Dated: 18-05-2018. Public Services – State and Subordinate services – Stipulation of minimum service for promotion or appointment by transfer to next higher category – Adhoc Rule - Issued. 1. G.O.Ms.No.627, G.A. (Ser.A) Department, dt.21.12.1983. 2. G.O.Ms.No.230, G.A. (Ser.A) Department, dt.31.05.2014. 3. G.O.Ms.No.4, G.A. (Ser.A) Department, dt.05.01.2016. 4. G.O.Ms.No.345, G.A. (Ser.A) Department, dt.02.09.2016. 5. From the Telangana Secretariat Association, Letter, Dt:19.08.2017. Officers, Teachers, Pensioners & Workers T.S., Hyderabad, dt. 28.3.2018. In continuation of the G.O.3rd and 4th read above wherein adhoc rule was issued reducing the minimum service required for promotion / appointment by transfer involving promotion from 3 years to 2 years for the panel years 2015-16 and 2016-17, and after careful examination of the matter on receipt of representations received in the reference 5th and 6th read above along with other matters pertaining to Employees’ Welfare, discussed on 16.05.2018 and keeping in view the exigencies of administration, Government have decided to extend the said provision for the current panel year 2017-18 also i.e., up to 31.8.2018, so as to enable the appointing authorities to fill up the vacancies by promotion / appointment by transfer involving promotion. This adhoc rule shall come into force with immediate effect and shall be in force up to 31.8.2018.